Ex. 38:8 Moreover, he made the laver of bronze with its base of bronze, from the mirrors of the serving women who served at the doorway of the tent of meeting. While it’s probably not news to you that the bronze laver was made from the mirrors of the women, the role or service of these women just might be — it was to me. However, for the sake of those that haven’t considered the links of the laver, water, and women, let’s explore that first. In my posts on the Cup of Miriam, we took a long hard look at why women are so closely associated with water. It is just like our Elohim to use articles from women to build the one piece of furniture in the Tabernacle that contained water. Even more significant is the fact that mirrors are used to reflect an image. 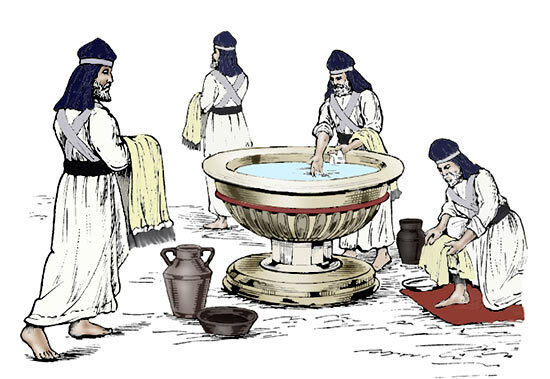 Thus, we often hear how the waters in the laver were there so the priests could “see” the dirt and wash their hands and feet. But it’s more than that. A mirror reflects beauty and defects. The Word of Elohim also reveals both when we look into it. This is why we need the constant washing of the water of the Word. The Hebrew word for mirror or looking glass is marah, but this word is ONLY elsewhere translated as “vision” — as in I saw a vision. You can see the connection with seeing “into” something. In other words, the purpose of the laver was to give spiritual insight about the state of a person’s heart. 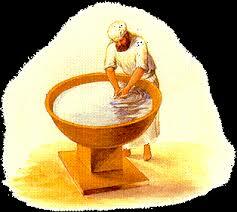 The washing was more symbolic than a remedy to physical dirt. In order to serve the King, you must be washed by His Water, which is the Word. Only the Torah can show you at once how beautiful and precious you are in the Father’s eyes and at the same time reveal your unsightly blemishes and spots. The Water of the Word is meant to cleanse us of these marks as James so aptly remarks in 1:25. This idea is expanded by the Hebrew word for laver, keeyor. This word means a furnace and also to purify. Once again we see the dichotomy of fire and water, both cleanse and purify. But who are these “serving” women at the doorway of the tent of meeting? The answer to this question is what provoked me to write this post. Translator’s (both Jewish and Christian) have a terrible tendency to diminish the roles or service of women. We have become so accustomed to this that we read right through a verse such as Exodus 38:8 and focus on the bronze (or brass if you prefer) laver and/or the mirrors. Yet, we know that there is not an idle word in the Torah. These women were important; and I for one, am ashamed that I never noticed their position until now. But, that’s what I’ve come to expect: the woman is always hidden! And I know that YHWH had divine intent and purpose for that as you will begin to see in my post on Deborah the Bee Part II. The Hebrew phrase for “the serving women who served” is hatzovot asher tzaveu. You can probably see the repetition of the Hebrew verb tzvah, which means to go forth, wage war, fight, and serve. It is directly related to YHWH Tz’vaot (LORD of Hosts). It carries strong military connotations. This should remind us of the eshet chayil or woman of valor. She too, is often obscured by translation and softened from a warrior to a woman of virtue, goodness, worth, or excellence. Why? Would it surprise you to know that tz’vaot is feminine? When we call on the God of Armies (YHWH tz’vaot), we are really saying God of (women) warriors. Apparently, the women who “served” at the doorway to the Tent of Meeting were warriors! Now, considering the context of their station, it would appear as though this was more of a “spiritual” guardianship. After all, the laver was made from their “visions” or “mirrors”. I imagine these women to be warriors of the faith, prophetesses, prayer warriors, and guardians of the Water of the Word. I believe there is evidence of this with the prophetess Anna. Luke 2:36-37 And there was a prophetess, Anna the daughter of Phanuel, of the tribe of Asher. She was advanced in years and had lived with her husband seven years after her marriage, (37) and then as a widow to the age of eighty-four. She never left the temple, serving night and day with fastings and prayers. Of course, we also have a witness as to what happens when these women are either taken advantage of or in outright rebellion. 1Sa 2:22 Now Eli was very old; and he heard all that his sons were doing to all Israel, and how they lay with the women who served at the doorway of the tent of meeting. In this verse, their role has been perverted; these women have become like the harlot mentioned in Proverbs instead of the righteous woman. Whether or not these women were manipulated, forced, or were the seducers themselves is not mentioned. I believe we have evidence of all these possibilities happening in our assemblies still today. Regardless of the reason these women strayed, we see the male counterparts in this story also falling away from their purpose. 1Sa 3:1-2 Now the boy Samuel was ministering to the LORD before Eli. And word from the LORD was rare in those days, visions were infrequent. (2) It happened at that time as Eli was lying down in his place (now his eyesight had begun to grow dim and he could not see well). There can be no coincidence that as the Word of YHWH and visions began to diminish, so did Eli’s eyesight. What is not immediately apparent is that the women are also related to the reduced visions by their association with the mirrors (visions) of the laver and the doorway. The proverbial “chicken or the egg” question might pop into your head. We want someone to blame. But, I believe the point is that improper worship, negligence, perversion, and the like is the culprit here. Lack of the Word means lack of vision and eyesight (insight, foresight, and hindsight). Torah is our One True Mirror! Without it we perish in our perversion. Since women are often associated with vision and the prophetic, these next verses shouldn’t surprise you. The Greek indicates that this “slave girl” was actually a bond-servant. Notice that Peter has to go through HER to get inside. She is the gate-keeper to get to the court of the high priest. And what does she do? She immediately “sees” right through Peter. She knows that he is one of Yeshua’s disciples! But he lies, and this becomes the first of three denials he makes of the Master. This happens with wives and their husbands as well. A woman meets her man at the door to question him on some issue and if he lies or denies the thing —- she can usually “see” right through him! Since women were created to be managers and guardians of the home, we shouldn’t be surprised that YHWH gave women this role in His House as well. If we lack vision, perhaps we need to visit the laver. What do you see when you look into the mirror waters? Look closely and allow the waters to fully reveal the good, the bad, and the ugly. Once revealed, true beauty emerges. Eph. 5:25-27 Husbands, love your wives, just as Christ also loved the church and gave Himself up for her, (26) so that He might sanctify her, having cleansed her by the washing of water with the word, (27) that He might present to Himself the church in all her glory, having no spot or wrinkle or any such thing; but that she would be holy and blameless. H4759 from H4758 (mareh) meaning view or appearance. 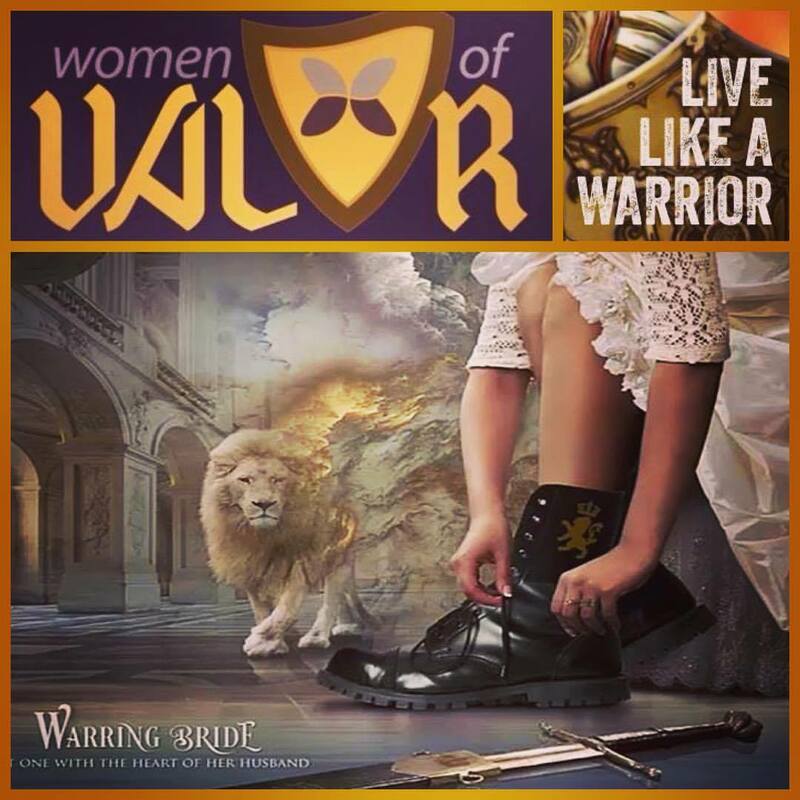 For more information, see my post The Biblical Role of Women Part IV, which defines the Eshet Chayil or Woman of Valor.